Instrument panel is composed of speedometer housing, tachometer and instrument cluster gauges. 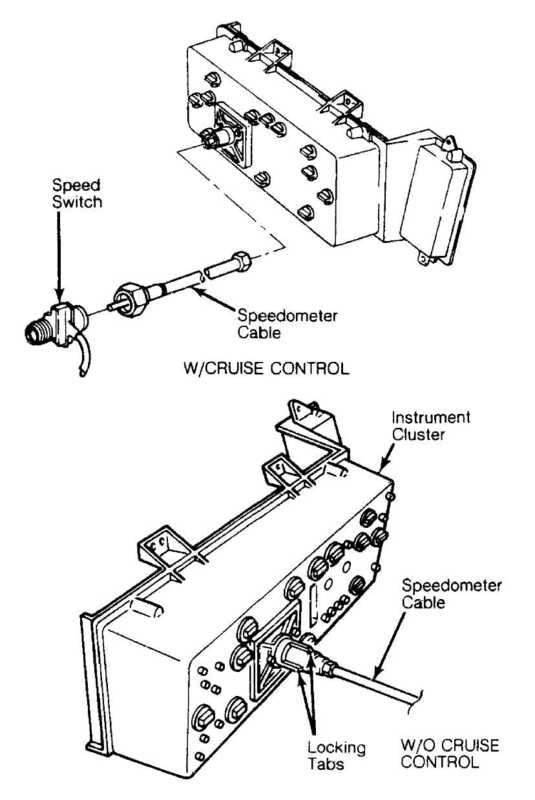 System consists of a fuel gauge, an in-tank sending unit, and appropriate wiring. Fuel gauge is grounded through variable resistor of sending unit. A float attached to a slide rheostat follows fuel level and varying resistance increases or decreases indicator reading. System consists of gauge and sending unit and appropriate wiring. The gauge is grounded through variable resistor of sending unit. Changes in coolant temperature vary resistance in sending unit, increasing or decreasing indication on gauge. The voltmeter indicates regulated voltage to provide an indication of charging system’s ability to maintain battery charge. The oil pressure gauge system consists of gauge and a variable resistance sending unit. Gauge needle, attached to bi­metallic strip, responds to temperature changes. cable from speed switch. See Fig. 1. On models without cruise control, raise vehicle on hoist. to instrument panel. Move housings aside. carefully pull cluster and speedometer toward rear of vehicle. Fig. 1: Speedometer Cable Disconnect Points Courtesy of Chrysler Motors. speedometer, tachometer, or gauge being serviced. To install, reverse removal procedure.